Music of Jeff Pockat - jeffpockats jimdo page! Collection of traditional Irish and Scottish pieces done on a wire-strung harp. plus $1.00 domestic shipping per each item ordered, cap at $5.00. Collection of original music done on the wire-strung harp. "Spiritual autobiography in music." 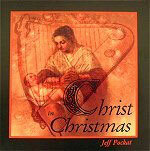 Collection of traditional Christmas music from around the world with an original title cut.